Ahh, rum. The wonderful distilled product of cane. I feel the same way about it as the poor deluded souls from the Peat Clan feel about their Islays. Partly, of course, that comes from my background – almost half my life was spent in the Caribbean – and while my first recorded drunk was done with local vodka (don’t ask), it is to the rums that my primary allegiance was given, and where it remains. Rums as a general rule originate from the Caribbean, but there are others from as far afield as Canada UK, USA, Australia, Fiji, Brazil, India, Indonesia and Mauritius, among many others. 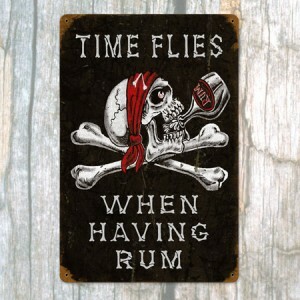 The precursors to rum are supposed to date back to antiquity. Development of fermented drinks produced from sugarcane juice is believed to have first occurred either in ancient India or China, and spread from there. An example of such an early drink is brum. Produced by the Malay people, brum dates back thousands of years. Marco Polo also recorded a 14th-century account of a “very good wine of sugar” that was offered to him in what is modern-day Iran. Whatever the case for the ancients, the first distillation of rum took place on the sugar plantations of the West Indies in the 17th century. Plantation slaves first discovered that molasses, a by-product of the sugar refining process, can be fermented into alcohol. Later, distillation of these alcoholic by-products concentrated the alcohol and removed impurities, producing the first true rums. Tradition suggests that rum first originated on the island of Barbados; and although my experience is that the Bajans like to take credit for doing everything first (these are, after all, the modest folk who sent a telgram to King George saying “Your Majesty, you may join the war: Barbados is on your side,” at the onset of WW2), it’s likely that in this case their claim is probably true. A 1651 document from Barbados stated, “The chief fuddling they make in the island is Rumbullion, alias Kill-Divil, and this is made of sugar canes distilled, a hot, hellish, and terrible liquor”. Sounds like many a rum I’ve had (some from Barbados, ha ha) when not having a pot to piss in in my youth. The selections I see in the various stores I now frequent, have been limited to the staples of single-digit Bacardi, Appleton, Captain Morgan, Mount Gay, Flor de Cana, Havana Club and Lambs with a few others thrown in from time to time. Occasionally I see the English Harbour, Pyrat’s or Screech, but it’s the big guns, the older vintages, that are so sadly lacking here (as well as the experts who can discourse for hours on the nose, mouthfeel and finish, and identify every fruit within by its first name). I won’t go so far as to say we never see the good stuff here in the sticks: we just never see the good stuff all the time. One can always find a Glenfiddich 21 year old or a Johnny Walker Blue Label in a glass case somewhere, but good luck finding Appleton 30 year old, the DDL 21, the English Harbour 25 or that mythical XM 50 (which, for the life of me I cannot recall where I heard about, but for some reason I’m absolutely certain exists in spite of two decades fruitless search for either a bottle or a mention on Google). Be that as it may, Liquorature – and its successor, the Lone Caner site – has made the whole business of acquiring and tasting rum a lot more systematic than was previously the case. Being the only banana-man in the joint helps in that I really do like rums more than that obscure Scottish drink…maybe it’s the sweetness, or maybe it’s just the obstinate desire to be different. Whatever the case, it’s a diverting and harmless pastime, allows me to score points of the Last Hippie (or him off me), brings enjoyment and fun to the party, and permits me to indulge my writing. The fact that I also taste some of the best rums in the world while attacking some poor sod’s choice of book (and then get to pen an essay on the subject) is merely a bonus.